Basic -- AfricanArguments.org: After AMISOM: What will it take to secure Somalia? AfricanArguments.org: After AMISOM: What will it take to secure Somalia? There are four broad things Somalia must do to be able to maintain its own security. AMISOM has been operating in Somalia since 2007. Credit: AU-UN IST PHOTO /STUART PRICE. Once again, Somalia’s government and its international partners are trying to implement a transition. This time, the goal is to transfer responsibility for the country’s security from the African Union Mission in Somalia (AMISOM), first established in 2007, to local forces. The transition plan was agreed in early-2018. Its initial phase involves three main goals. One of those missions – handing over control of Mogadishu stadium from AMISOM to Somali forces – has been achieved. But the other two – securing the main supply route between Mogadishu and Baidoa, and capturing the strategically-located town of Leego – remain works in progress. Transferring control from AMISOM, which has been combating the Islamist militant group al-Shabaab for well over 11 years, will not be quick or easy. Without a peace deal, it will probably take around a decade, for which supporters should prepare accordingly. Ultimately, Somalia’s transition will involve tackling four big issues. Al-Shabaab has had a pretty good couple of years. The group has retained control of considerable areas of south-central Somalia. Its fighters have continued to blend with local populations, moving with relative ease and infiltrating Somali security forces. It has generated more than enough financial resources. And it has maintained a high tempo of attacks on Somali and AMISOM targets. Between October 2017 and April 2018, al-Shabaab claimed 418 attacks, including military assaults, IED detonations, ambushes on convoys, suicide attacks, and assassinations. Just over half of these targeted the Somali National Army (SNA) and aligned militias. A little over a quarter targeted AMISOM. Al-Shabaab has increased its war of destabilisation recently in part because AMISOM and the SNA have significantly reduced their offensive operations. Since 2016, only a handful of AMISOM forces and some US-trained Danab units (Somali commandos) have conducted offensives against the Islamist militants. Since 2017, there have been fifty or so US strikes by drones and special forces. These operations have enjoyed some tactical success, but haven’t been sufficient to tilt the strategic balance across the region nor stop al-Shabaab exerting influence over local populations. Even in Mogadishu, the group is still able to operate and extort money from many local businesses. 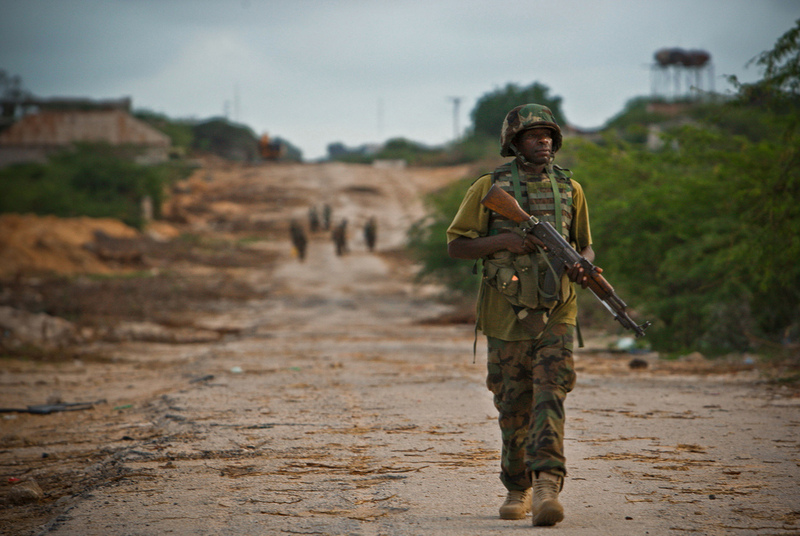 The record of Somalia’s security forces has been mixed thus far. On the one hand, there has been progress in developing the Somali police force at the federal and some regional state levels. This is important because most internal threats facing Somalia will require a law enforcement rather than military-led approach. On the other hand, the SNA remains deeply unprepared, with the exception of the Danab units. An assessment conducted in late-2017 concluded that the army is badly deficient across every key dimension from command and control, logistics, equipment, infrastructure, and morale. It has been hobbled even further by corruption among some political leaders and senior officers. The SNA remains a national army in name only. It is incapable of conducting sustained offensive operations against al-Shabaab and is seen in consistently negative terms by too many locals who have suffered abuse and extortion at the hands of its soldiers. Somalia’s transition plan requires AMISOM to reconfigure. As I detail in my new book, this is not the first time the force has had to do this. The African Union (AU) and some of its international partners recently assessed AMISOM’s capabilities and deployment configuration to help determine its new role. It is now up to the UN Security Council and AU to decide the way forward. AMISOM’s basic problem is that it is meant to be a counterinsurgency operation, but is not well set up to do this. Its troops are overstretched. It lacks rapid, mobile strike forces. And it doesn’t engage enough with local communities due to language barriers and because patrols have become riskier. Today, AMISOM’s most important tasks should arguably be to: keep al-Shabaab forces out of south-central Somalia’s main population centres; secure the main supply routes between those settlements; and put the group’s leadership back on the defensive. But it faces several challenges. One of these is persuading its troop-contributing countries – Burundi, Djibouti, Ethiopia, Kenya, and Uganda – to mount operations that could risk significant casualties. This is despite the fact that AMISOM is already taking on heavy casualties protecting its overstretched forces and moving along insecure supply routes. A second challenge is that even with sufficient political will, the specialised units and assets required to destroy al-Shabaab’s main combat capabilities are in short supply among the mission’s troop-contributing countries and indeed across Africa. Beyond its military component, AMISOM’s roughly 700 police officers have made solid progress supporting Somali police forces. However, the mission’s tiny civilian component (authorised at just 70 personnel) has not deployed out to the regional sectors to help stabilise settlements recovered from al-Shabaab, some of them several years ago. International efforts to stabilise Somalia involve over forty states and multilateral organisations. It is crucial their activities are coordinated and that they maintain realistic assumptions about how long even successful war-to-peace transitions take, especially when there is no peace settlement to end the war against al-Shabaab. Today, two areas of international engagement stand out as particularly problematic. Firstly, international actors have let AMISOM down financially. Since January 2016, the AU peacekeepers have received monthly allowances of approximately $800, much less than the $1,350 earned by their UN counterparts. Failure to adequately finance AMISOM – a mission authorised by the UN Security Council – has negatively affected its morale and effectiveness. Secondly, international partners need a new model for giving external security assistance to Somali forces. Pouring money and equipment into an institution as corrupt as the SNA was always risky, but there were no good alternatives while trying to eject al-Shabaab from Mogadishu. Nevertheless, it is now clear that the last decade of efforts by about a dozen foreign actors to build the SNA haven’t worked. The case for business-as-usual is unpersuasive. What approach should take its place remains an urgent question for policymakers in Somalia and beyond to answer.